Friday contained some pregnancy excitement. I went to Labor and Delivery (L&D) at the hospital. Long story short, I was afraid I was leaking amniotic fluid. (And no, smart mouths, I did not wet my pants :-p) My doctor’s office sent me to L&D for testing and monitoring. Everything there checked out, but when they called my doctor to let her know, she asked me to come over to the office (practically across the street) for an ultrasound and so that she could talk to me. The ultrasound was a nice little perk, and I was (again) told that I actually have more than enough fluid for one baby. I joked that my body doesn’t know how to produce the right amount for just one. 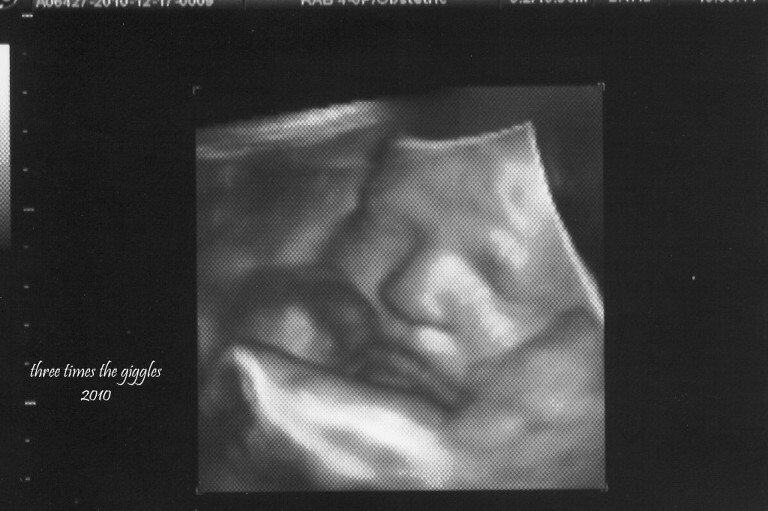 During the ultrasound the tech flipped the 3D switch to check on some things and snapped a cute picture of baby girl’s face! So the verdict at the office? I was not leaking amniotic fluid, but rather had an infection. After a weekend on antibiotics I’m back to feeling normal. Whew! I’m not going to lie, when I was driving myself to the hospital (Nick was staying home with the monkeys) I had to fight tears off several times at the thought of having another preemie. I’m so relieved to know that everything is fine and as it should be and that it looks like I’ll still get to wait until February 3rd to have this little one! On a totally unrelated note, say a little prayer for the boys. Chase had a 24 hour stomach flu on Saturday and Jackson woke up at 4am this morning to be sick. He’s now laying on the couch looking totally miserable. Poor kiddo! Good to hear that everything is okay with Baby Girl.